It says: UnboundedPeople is a community that connects travellers from all over the world. Not only while travelling, but also if you want to make plans or have already arrived home. Sounds interesting, I tried it and opened an account. The founder Tessa Eberson also has an own travel page there. The idea behind is to connect travellers from all over the world. But a far more interesting feature, at least to me, is the idea of collecting pictures of places you come across the internet and you fall in love with. These pictures or places you can simply collect into a Bucket list. A caption can be added or not. I love this feature because I myself have several places and folders at my lappy where I have my bucket list. A part of it is on my smartphone as notes, some of it even in an old school “physical” note book. The new community also has a kind of timeline where you can just publish whatever crosses your mind and see other peoples thoughts and posts. You can also like and comment on posts and users. 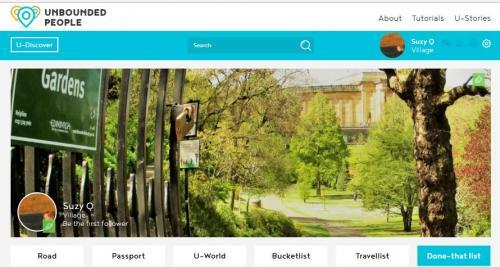 After setting up an account you can set up a Bucket List, a Done-That List, a Travellist ( for upcoming trips) or pin your destinations into a world map. A live chat is planned to connect travellers directly, but no one was online when I checked. The design is clean and colors remind of beach asian destinations. Seems like the site is quite new and somehow completely unknown in europe. But it should not be! It is am ambitious idea and as a confirmed entrepreur, I respect and support the founder’s idea and effort ! Although I am not a big fan of just collecting destinations for the sake of it, I like the new site very much and recommend it to anyone who wants to hear it! I set up an account and my first own item about a New York City trip from 1,5 years ago. Check out the Page ! It is worth it.